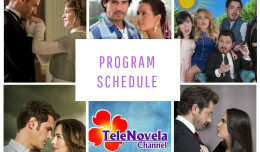 In the Name of Love: Episode 62 | TeleNovela Channel - Bringing you closer to lifes drama. Carmen gives Macarena an envelope containing Iñaki’s letter while Rafael gets furious when he found out that Camila and Orlando are together. Meantime, Carlota confesses her love to Cristobal but he rejects her. Diana desperately tries to find an excuse not to go to Emiliano’s party.